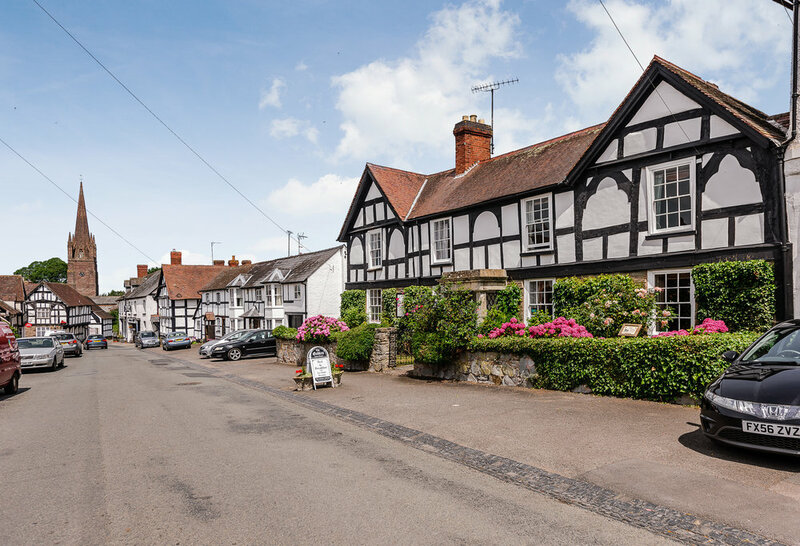 Weobley has a population of around 1,250 people and is Herefordshire’s largest village. As a result, we are fortunate to retain some key local services such as a grocer, a butcher, fruit and veg, and hardware stores, as well as a Post Office/banking facility. We also have a bookshop and a craft shop, in addition to our very own pottery. Weobley museum is filled with local history records and relics from times past. We also have an active History Society with monthly meetings. There is a bowling green and club on the outskirts of the village, and a kart track (Raceway) one mile away. Walking, including Offa’s Dyke: Being surrounded by beautiful rural countryside in all directions it is no wonder that we are much loved by walkers and cyclists. Weobley has its own publication called “Weobley Walks”, detailing many outstanding walks through kissing gates and cider orchards. And there are many other Herefordshire Walks, detailed in The Wye Valley Trail publications. The Offa's Dyke footpath is accessible by bus (see below) or by car at Kington (8 miles). Local farmers have kindly offered up permissive routes through their land to responsible walkers and their dogs, actively encouraging us to see how they care for our countryside. Norman Castles and Churches; Mappa Mundi: Weobley Castle was built in the twelfth century. Alas only the earthworks and moat remain but there are many Norman castles in the Herefordshire area built to keep the marauding Welsh at bay: Goodrich, Eastnor, Clifford and, reputedly the earliest of them all, was at a place near Ewyas Harold. The Weobley church of St Peter and St Paul also dates back to the twelfth century, has the second largest steeple in Herefordshire and has some beautiful alabaster figures dating back to the civil war. There is the splendid architecture of Norman times exhibited at Kilpeck and the fabulous detail of the rood screen pre-dating the reformation at St Margarets.... Not to mention Hereford Cathedral’s truly unique Mappa Mundi (the oldest map of the world) and the historic chained library - a must see. Local Festivals, Hay-on-Wye literary festival: The Hay–on–Wye Literary Festival is held annually, in late May/June. If there is a book coming out you can hear all about it here from the author in person. Hay-on-Wye is renowned as the second hand book shop of the world. And there are plenty of food, music and arts festivals, agricultural shows and other popular events in the area throughout the year. The Gables is situated in the heart of the bustling village, a stones throw from a range of country pubs, salons, a popular bistro, village shop, organic cafe, garage and post office. Stunning riverside garden (open 10:30-4:00). UK's biggest rural film festival takes place in temporary cinemas in villages in Herefordshire, Shropshire, Malvern and the Marches. This year - an Ingmar Bergman retrospective. 5 April'Countrytastic' A celebration of country life. 'Imagine the World.' Visit the internationally renowned festival of literature. Meet writers and film-makers, historians and novelists, philosophers, environmentalists,poets and scientists ... the list goes on. 'The Woodstock of the Mind.' - Bill Clinton. 15-17 JuneThe Three Counties Show Annual agricultural show from the Malvern showground. 'The Heart of England's premiere celebration of the countryside and rural life.' Other events throughout the year. See website. 30 June-1 JulyBromyard Gala Bromyard Gala, a great old-time country show. Fair, Steam Engines and Vintage Cars. 30 June-1 JulyShobdon Food & Flying Festival The best local gastronomy, a host of aviation attractions. To be held at Shobdon Airfield, near Leominster. 20-22 JulyNozstock Music Festival (Bromyard) Family-run music festival in The Hidden Valley. Performance, art, electronic supersounds and good old-fashioned guitar-strumming and drum-bashing. And find out just 'Who is Noz'? 21-22 JulyMuch Marcle Steam Rally Steam Traction Engines, Vintage Tractors, Vintage Commercial Vehicles, Vintage Motor Cycles and Cars, Stationary Engines, Fairground Organs, Fun Fair, Models and Crafts. In the heart of the stunning Hereforshire countryside. Much Marcle near Ledbury. 28 July-4 AugHereford 2018 / The Three Choirs Festival A week long choral & classical music event. Hereford hosts the festival this year in rotation with Gloucester and Worcester. 6-9 SeptemberBromyard Folk Festival A traditional music, song and dance festival in the Welsh Border area. Started in 1968, now attended by thousands. 8 SeptemberKington Show Horse show and agricultural fair. Meet the local community. 8-16 Septemberh.art Herefordshire Art Week Herefordshire's open studios giving visitors exclusive access to artists' studios, workshops and exhibitions. A nine day art trail to raise artists' profile and sell artwork. All YearMappa Mundi and Chained Library Exhibitions at Hereford Cathedral The unique Mappa Mundi is the oldest map in the world. All YearThe Black and White Museum This is a fine example of a Jacobean timber framed building, with its very own ghostly tradition. Built in 1621 and now a museum, it is situated in the heart of Hereford. All YearExplore the region's beautiful churches and cathedrals. Full details can be found here. All YearCheck out Herefordshirelive for live events. All YearSee VisitHerefordshire.co.uk for more. There is a wide variety of things to do locally. Golf, horse-riding, canoeing, karting, quad-biking are all close options. Cycle hire and canoe hire facilities are readily available. We have a local bus service that passes through the village from Hereford (12 miles) to Kington (8 miles) on the Welsh border. There is a train service from Leominster and Hereford, however there is only a bus service from Hereford to Weobley. A Taxi service operates locally from Leominster and Hereford.